Southeastern Kodiak Island, including Kaiugnak and Sulua Bays, and the eastern half of the Hepburn Peninsula. See area map (Image file 75 kB). Grass, alder and willow make up lowland areas and drainages. Coastline includes sandy and boulder-strewn beaches, jagged cliffs, tidal flats, and steep bluffs. Inland areas are composed of foothills, river valleys, rugged mountain peaks to 2417', alpine lakes, and marshy lowlands. 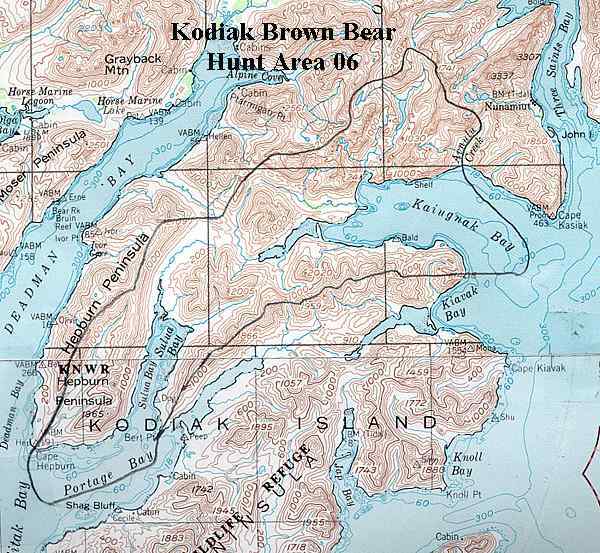 Lands are primarily Kodiak National Wildlife Refuge, with some Akhiok-Kaguyak Inc. lands located around Kaiugnak Bay.